The Eglu Go UP Chicken Coop is designed to sleep between 3-4 bantams or 2-3 larger breeds such as Brahmas and Buff Orpington. It is available standard with a standard 2 metre run including a shade, as well as a feeder and drinker. The run can also be extended by 1m to make it longer to give your chickens more space to move round. Accessories such as extra feeders, drinkers, durable covers and jackets can be purchased separately to protect your chickens and your coop from the elements. The Eglu Go UP chicken house is available with optional wheels. This is highly recommended for anyone wanting to move their Eglu regularly, particularly if you are living on your own. Simply press down both levers with your foot to lift the run, and use the wheels to move the Eglu chicken coop. 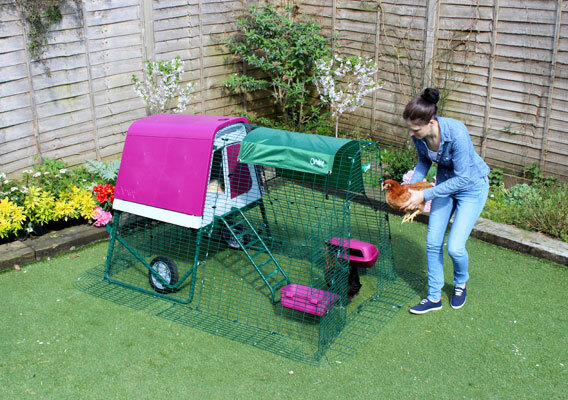 The wheels can be used with your Eglu Go UP whether you have a chicken run or not. You just need to have the frame to attach them to. You can easily purchase and attach the wheels at any time after the Go UP has been bought and assembled. The Eglu Go UP chicken house has all the great benefits of the Eglu Go, on legs. Your hens will love to roost up off the ground, sleeping in a warm and cosy hideaway, and having a private area to escape to lay their eggs. They will quickly learn how to use the ladder to climb up to their home, and the house will act as a sheltered spot for hens to play under too. It's not just the chickens that will love the Go UP though – you will too! You'll find that the convenient height makes chicken keeping a delight! There's no need to bend down to clean the Eglu chicken coop or collect the eggs. The freshly laid eggs can be plucked from the nest simply by opening the door at the back as well as the innovative slide-out dropping tray that's eaily wiped clean. Made from energy efficient polymers, it's a hygienic home for your hens that will last for years and at the end of its life can be 100% recycled. This manual will cover the parts you should receive with your Go UP, and step by step illustrated instructions on how to assemble the Go UP from start to finish. You will also find advice on how to maintain your Go UP and also tips and hints on keeping and looking after your chickens. The total build time for constructing your Go UP is around 1.5- 2 hours.